2016’s Happy Bhag Jayegi was a very successful romantic comedy about Harpreet Kaur (played by Diana Penty) who ran away from her wedding with Daman Singh Bagga (Jimmy Shergill) to find herself in Lahore taken in by Bilal Ahmed (Abhay Deol). In 2018 Happy is back, but this time with Sonakshi Sinha in the lead role in Happy Phirr Bhag Jayegi. Set in China this time, there’s bound to be plenty of machismo, the girl coming out on top, some great one-liners and a strong Punjabi vibe. Sohail Sen has been asked to pen the score for this album, so it will be interesting to see how musically he brings Punjab to China. Where else to begin this soundtrack but with some classic bhangra in Swag Saha Nahi Jaye. Shadab Faridi, Neha Bhasin and Shivangi Bhayana are all asked to bring people onto the floor with this bhangra set to a hip-hop beat like so many others are today. The words don’t fit this confused beat, but they don’t need to as the beat is left in the background throughout the song and not allowed to take over at any point. Synth sounds are used to hide the melody but once the listener gets past this it’s obvious that the tune is a known one. The trumpet is a nice touch but little else in this song of worth. The title track is up next, Happy Bhaag Jayegi. An interesting combination has been looked at here in Daler Mehndi and Harshdeep Kaur. Daler is very loud and well matched by the return of the trumpet from song 1 and brings a fun element to the whole thing. But even though Harshdeep is also a brilliant singer, she gets left in the background here as it’s not easy for her to match the loud pairing of Daler and the trumpet. Behind these 3 is a mashup beat, extracting elements from old classic Hindi and Punjabi songs in little snippets. While the first two are reminiscent of older tunes, the next song is Chin Chin Chu, which is a straight remake of the song of the same title danced by Helen so many years ago. 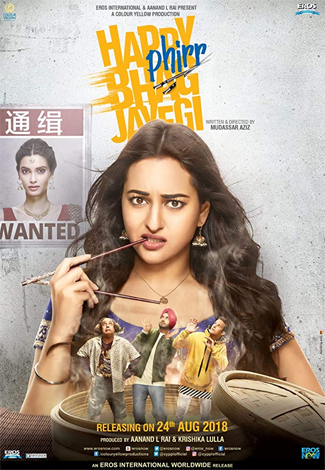 Just to keep in Punjabi style, the lyricist has changed it to “Hello Mundiya how do you do?” which is ironic when Sonakshi in the clip is asking a Chinese man, but else once again there is only the desecration of a decent song. Jassi Gill and Sonakshi Sinha both struggle as singers especially compared to Geetha Dutt who sang the original. For a change up, we next have Koi Gal Nahi. The song talks about letting the world go even if it isn’t going your way. The change here is that its mostly in Hindi which is helpful for those non-Punjabi viewers. Still there is plenty of Punjabi Folk style mixed with a western shootout. Shahid Mallya and Piyush Mishra are backed by a female chorus who provide a good counter point to the male singers. Mudassar Aziz makes it a trio of male singers by performing the rap break left towards the end of the song just to break it all up a bit, but this song is tremendously repetitive. In a final twist to the whole album Udit Narayan is accompanied by Shivangi Bhayana in Kudiye Ni Tere. Sohail Sen obviously wanted a 90s love song and wanted an ode to Govinda the great actor thus this song was born. There is a mix of English and Punjabi lyrics, however since there is such a major difference between the male and female leads in terms of both pitch and volume as well as their capability with the language it becomes difficult to pick up on it. So that’s the album. In 2016 the story took the characters to Pakistan and thus a certain style was employed there. This time the story has moved to China, so we are given Chin Chin Chu. To determine a rating for this film its difficult to get past that point and just see it as funny in today’s environment. However, no doubt even from the trailer there will be plenty of laughs to be had so maybe these 5 minutes can simply be ignored. Outside of this though are 2 songs which have been inspired, 1 which is so repetitive its boring and 1 where the singers are all wrong for each other. While all this may serve a purpose in the film, its hard to see many making the playlists of anyone who isn’t hooked into a lot of Punjabi music already and thus hard to rate high. 16 queries in 0.665 seconds.